Pamela Geller* (Atlas Shrugs) and Robert Spencer ** (Jihad Watch), are not the kind of people, Geert Wilders likes to show himself off with. In Europe, that is. On May 1st, in Los Angeles, he will do, what he avoids doing in Europe: Associate openly with 100% racist loonies, suprematists and war-mongerers. Again. For Wilders' outrageous and hollow hate-speech (I have no time to give you a link) against Muslims, Obama and Liberals in May last year in the same LA, has left his US adorators longing for more. They have produced a one-hour long movie "Islam Rising", featuring Geert Wilders as "the Winston Churchill Of Our Times (Pamela)". German Nazi-Nostalgics from the NPD, but also "modern" German, Swiss and Austrian racists, who say that they are inspired by the actual Israeli politics, such as the "Politically Incorrect" hate blog and others. But Wilders NEVER acknowledges their support and, at the same time, NEVER explicitly dissociates himself from those (hidden) anti-semites, either. He thinks that he can get away with Likud and Israel Beteinu support, for the Dutch feel guilty about the huge number of Jews, carried away 1940-45 from Holland to Auschwitz with the active and passive help from many among them, and they will not dare to discuss Holocaust. He also thinks, that he can get away with Daniel Pipes, whom he invited as an "expert" to his Dutch hate-mongering trial. In fact, I think, that Wilders is completely dependent on Israeli-US financing of his agitation. That is why, for instance, he announced his solidarity with an ethnic cleansing of Palestinians (muslim AND christian) from Palestine, NOT in Dutch Parliament, but in Copenhague, so as to satisfy his Israeli-American sponsorers, without provoking an upsurge among the Dutch, who oppose of course nearly all such an outrage. Enjoy (above) the trailer of the Spencer-Geller movie celebrating the clown Wilders! Please, join us at the LA information campaign, against anti-semitism, against anti-muslimism and against anti-Holland agitation, at a meeting on May 1st in Los Angeles, time and location to be announced soon! The historical struggle in Washington about Health Care Reform went mostly under the horizon of the European mainstream press, lastly. One understands why. The procedure got stuck, last autumn, in the dark alleyways of US decision-making on the federal level. For it is complicated to understand, why a Senate and a House of Representatives, both with a comfortable 50%+ majority of Democrats, cannot agree on a set of arrangements that are, since dozens of years, part of the civilization of most EU countries: Collective insurance, guaranteeing access to health care for every citizen. What the Obama team is proposing in the United States, is nothing more than a first step into a world, where the 20% not-assured- and the 25% insufficiently protected citizens, will get access to a compulsory (yes!) basic protection against being left behind, when they fall ill.
angst for state constraint on decisions on life and death, on abortion and on church-prohibited matters - imagining local "death committees", repayment of abortion charges, advantages for illegal immigrants and making God-abiding citizens pay for other people's sins while caring AIDS patients, for instance (here we find the fundamental Christian Right together with the Libertarians). President Obama is not only a fine expert of the American Constitution and its guarantee for all citizens to be able to struggle for happiness, but he is also influenced by the Chicago School of Community Development. This School has adopted the view, that (local) emancipation of people in disadvantaged situations is best served, when their aspirations are coupled with advantages for the men and women in power. The result is a, you could say, rather cynical and resolutely NON ideological approach to empowerment. New coalitions are to be built around every step forward to emancipation and more equality. That is why, in my opinion, President Obama has spent so much effort and time in building a large and diversified majority for his health care plans, leaving behind, under way, many principles of it, in exchange for support from people of whom he hoped that they would find more (immediate) profit in supporting the laws, than in refuting them. As the American economy and the American private-public relations are different from the same, when you are dealing with a difficult urban neighborhood, this strategy did not work. Even a provisionally Senate-adopted set of laws, full of "pork"*), could not pass the hurdle of a 60% majority in the Senate. So, to my relief, Obama changed recently his strategy and decided to use legal means at the disposal of the Presidency and the Democrat majorities in House and Senate. There is nothing revolutionary in that. Former president G. W. Bush made his outrageous tax-cuts for the rich also into law in that way. And he had a smaller majority than Obama. This Rooseveltian (regulating the cisis-ridden economy during the 30's) and Johnsonian (social system and race equality) Obama-operation, is nearing its completion, these days. It is more than due. Liberal support is withering away, and "tea-party" like demagogy is not only on the move in the US, but also in Europe and in Israel. In Europe, a Wilders does not hide his contempt for Obama (Copenhague and recently in London), an Ulfkotte spreads his venom on German websites, etc. 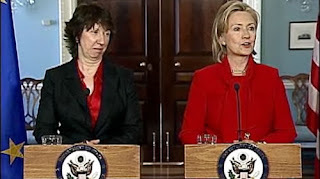 The Israeli Government humiliated the Obama administration with its continuing colonizing policy. March 15, 2010: "I have no intention of not passing this bill," says Speaker Pelosi. She doesn't have the votes, as her own whip, James Clyburn, said yesterday on Meet the Press. But pro-life Democrat Bart Stupak told National Review late Friday, "they've been able to peel one or two of my 12," and he sounds discouraged: "It's almost like some right-to-life members don't want to be bothered." That sounds more like five or six. Fox News calculates Pelosi has 211 of the required 216, with many still undecided, while Nate Silver guesses she'll get "between 216 and 218." Nobody has a clue, but the mood is upbeat. Chance of passage: 55 percent. 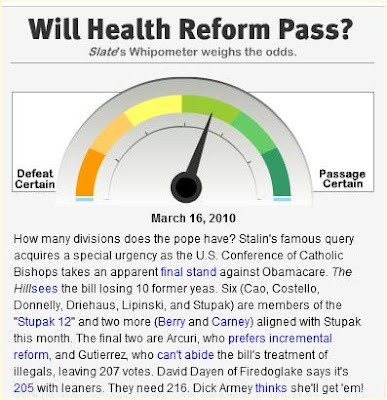 Slate's Whipometer: How many vote-switchers does the pope have? Slate's "Whipometer" indicates a small but real opportunity that the bill will pass later this month. The European stake in this titanic fight is big. If Obama looses, he will be weakened in all possible fields where Europeans need the support of the US for policies that differ from those that were pursued by the Bush-Cheney administration: Iran, Israel-Palestinian peace, world-wide regulation of hedge funds and credit swaps, Afghanistan, engaging Russia, engaging the Muslim world, nuclear disarmament and also climate change policies. More so, a continuous divergence between the US- and European(-Canadian) social systems, would kill the necessary harmonization and cooperation in the globalized world economic and financial field. Only if, what I cannot bring over myself to imagine, Europe would abandon its "aquis" in the social field, a harmonization the other way around, would set the conditions for a (doomed) Atlantic supremacist "white 21st century". There is much at stake in Washington for Europe, the next weeks! Due to my travelling to meet Central and East European friends in order to discuss with them the problems of redeveloping urban neighbourhoods in crisis, I missed the newly elected European Council President Herman van Rompuy's historical intervention at the Bruges European Academy.